When I first saw Glastonbury Tor, it was shrouded in morning mist, a lone figure on a hill leaning towards the right as if pushed by the wind. Surrounded by green meadows and grazing sheep, it seemed to call me towards it. There is a foot path on the west side of the hill with steps carved into the earth. With each step I took towards the Tor, it felt as if I was moving into another time and place. The ancient stones were pitted and weathered and gray, yet surprisingly well-fitted. There was a moment when the sun peeked out, illuminating the stone, giving it a sheen of gold and silver.....a gift of beauty bestowed by the ancient Gods. 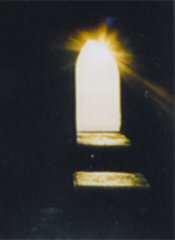 From the shadowy interior of the Tor looking through the arched doorway, I saw the bright sun shining on the pretty English countryside. I looked from darkness into light, as if I was viewing the scene from the "other side". I felt the ancient veil between the worlds becoming a gossamer web, so thin that I had to have a care not to go through. Glastonbury Tor is at the center of the English Ley Lines (Lines of Power) which radiate outwards in straight lines from the Tor. 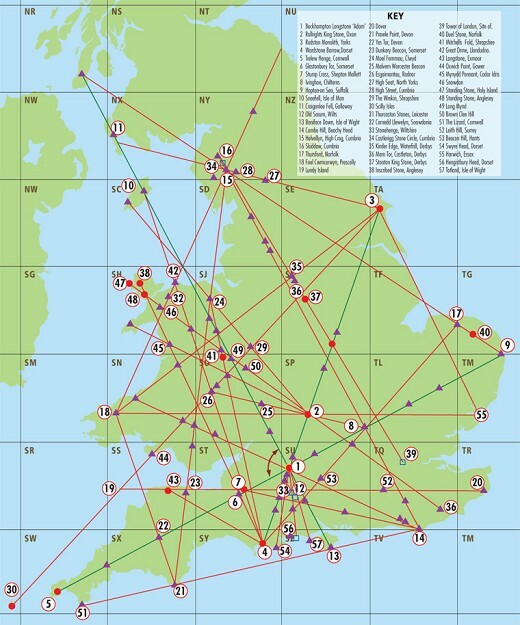 Directly on the Ley Lines are Old Sarum, Clearbury Ring (a set of earthwork rings), Woodhenge, the Uffington White Horse, Dargon Hill, Winchester Cathedral, Avebury and Stonehenge among other sacred sites. Remember that these are straight lines, connecting each of these places of power. To sit on a Ley Line (which I have done) is a power gathering experience....you can not only feel the physical power course through your body, but also the more subtle metaphysical/magickal energy. 39 Tower of London, Site of. 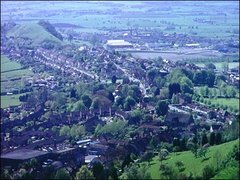 The town of Glastonbury is a delightful mixture of metaphysical shops, fortune tellers, shamans, witches, charlatans and wizards. It's a must-see for anyone interested in the Craft. 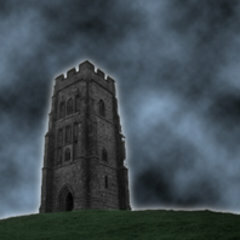 Glastonbury is said to be the legendary Avalon of King Arthur and he is supposedly buried somewhere near. The Tor is said to be the haunt of the King of the Fairies, (Gwyn ap Nudd) who is also known as the WildHuntsman who rides on dark and windy nights over the hills. Published 2001 "The Wiccan Read"